Neuroinflammation, initiated by cerebral infection, is increasingly postulated as an aetiological factor in neurodegenerative diseases such as Alzheimer’s disease (AD). We investigated whether Chlamydia pneumoniae (Cpn) infection results in extracellular aggregation of amyloid beta (Aβ) in BALB/c mice. At 1 week post intranasal infection (p.i. ), Cpn DNA was detected predominantly in the olfactory bulbs by PCR, whereas brains at 1 and 3 months p.i. were Cpn negative. At 1 and 3 months p.i., extracellular Aβ immunoreactivity was detected in the brain of Cpn-infected mice but also in the brain of mock-infected mice and mice that were neither Cpn infected nor mock infected. However, these extracellular Aβ aggregates showed morphological differences compared to extracellular Aβ aggregates detected in the brain of transgenic APP751SL/PS1M146L mice. These data do not unequivocally support the hypothesis that Cpn infection induces the formation of AD-like Aβ plaques in the brain of BALB/c mice, as suggested before. However, future studies are required to resolve these differences and to investigate whether Cpn is indeed an etiological factor in AD pathogenesis. The most common cause of dementia is Alzheimer’s disease (AD), which manifests in a familial and a sporadic form. The neuropathology in both conditions is characterized by neuritic or senile plaques, consisting mainly of amyloid beta protein (Aβ) and neurofibrillary tangles with hyperphosphorylated tau protein as its key components. Mutations in the amyloid precursor protein (APP), presenilin-1 (PS-1) or -2 (PS-2) genes have been associated with the familial form of AD . However, the most common type of this disease, sporadic AD, is not due to these mutations, and although risk factors have been identified, the initiating trigger is still unknown . The potential importance of infections in the development of sporadic AD has been recently recognized [1, 21, 31]. Specifically, not only various viruses like the human immunodeficiency virus, herpes simplex virus and cytomegalovirus but also bacteria like Borrelia burgdorferi, have been linked to the process of neurodegeneration [6, 12, 13, 17, 20]. Some data also suggest that Chlamydia pneumoniae (Cpn) should be added to the list of pathogens possibly involved in the pathogenesis of AD. Cpn is a widespread, obligatory intracellular pathogen, often causing acute respiratory infections including pneumonia, sinusitis and bronchitis [10, 11, 15]. This microorganism has also been implicated in a variety of severe, chronic diseases including some disorders of the central nervous system [7, 14, 30, 32]. In an initial study, Balin et al. demonstrated the presence of Cpn in brains of 17 out of 19 patients with sporadic AD, using a variety of techniques, including PCR, electron microscopy and immunohistochemistry, while the pathogen could only be demonstrated in 1 out of 19 controls . The presence of Cpn was demonstrated in various cell types like microglia, astrocytes, perivascular macrophages and monocytes, and predominantly in brain areas linked with AD pathology. Recently, these observations were confirmed . On the contrary, others were unable to detect Cpn in AD patient tissues [9, 22, 23, 28]. The only animal study so far supporting a role for this pathogen in AD demonstrated an AD-like pathology in the brain of BALB/c mice post Cpn infection . Three-month-old mice were inoculated intranasally with Cpn and the authors claimed that this resulted in the deposition of Aβ in the brain up to 3 months post infection with increasing pathology as the infection progressed. Based on these results, it was concluded that in naïve BALB/c mice, AD-like pathology could be induced by Cpn infection. In spite of these results, doubts remain concerning the amyloid-like plaques as being only unrelated elevations in amyloid . Because of the possible implications of this study and the need for confirmation, it was our aim to repeat these experiments under quite corresponding conditions. Moreover, we compared our findings with the pathology found in a transgenic mouse model of AD. The Cpn strain, TWAR 2043 (ATCC) was cultured and continuously propagated on Hep2 cells as previously described . Bacterial titres were determined by titration in Hep2 cells  and staining with a monoclonal Chlamydia LPS-specific antibody followed by a FITC-conjugated secondary antibody (RR-402; DAKO, Glostrup, Denmark). Titres were expressed as the number of inclusion forming units (IFU) per ml. A total of 43 female, specific pathogen-free inbred BALB/c mice were obtained from Charles River (Someren, The Netherlands). Animals were kept under standard housing and care conditions at the Central Animal Facilities of Maastricht University (Maastricht, The Netherlands). All experimental procedures were approved by the Ethical Committee for the Use of Experimental Animals of Maastricht University. At 3 months of age n = 24 mice were inoculated intranasally with 107 IFU Cpn in 10 μl (5 μl per nostril), and were analyzed at 1 week, 1 month or 3 months p.i., respectively, as shown in Table 1. Pilot experiments revealed that this dosage ensures both survival of the mice and optimal dissemination throughout the body. Another n = 15 mice were mock infected with a sucrose-phosphate-glucose solution (SPG, solution for storage of Cpn) at 3 months of age and were also analyzed at 1 week, 1 month or 3 months after mock infection, as shown in Table 1. In addition, two mice, which did not receive any treatment, were investigated at 4 months of age, as well as two mice at 6 months of age (Table 1). In addition, a 17-month-old transgenic mouse expressing human mutant APP751 (carrying the Swedish and London mutations KM670/671NL and V717I, under the Thy1 promoter) and human mutant presenilin-1 (PS-1 M146L, under the HMG promoter) was used (APP751SL/PS1M146L mouse; for a detailed description see refs  and ) (Table 1). This APP751SL/PS1M146L mouse was bred on a CBA (12.5%) × C57Bl6 (87.5%) background. As shown in Table 1, 15 mice were used to detect Cpn DNA in brain tissue with real-time PCR at different time points after infection with Cpn or mock infection. To this end the animals received a weight-adjusted dose of pentobarbital (Nembutal; Sanofi Sante B.V., Maassluis, The Netherlands) and were then perfused with sterile phosphate buffered saline. Brains were removed quickly and dissected into five different regions, i.e., olfactory bulbs, cerebellum, hippocampus, subventricular zone and neocortex. The isolated regions were snap-frozen in liquid nitrogen and stored at −80°C until further processing. DNA was isolated from brain material using methods previously described . The Nanodrop® ND-1000, a full-spectrum spectrophotometer (220–750 nm) was used to calculate the DNA content of each sample. Finally, the Cpn DNA copy number/μg DNA in the collected brains was determined by real-time PCR (ABI Prism 7000; Applied Biosystems, Foster City, CA, USA) using the following primers and probe; forward (5′TCCGCATTGCTCAGCC3′), reverse (5′AAACAATTTGCATGAAGTCTGAGAA3′) and probe (5′-FAM-TAAACTTAACTGCATGGAACCCTTCTTTACTAGG3′-TAMRA) as described previously [5, 29]. All PCR runs were performed in duplo. Mean Cpn DNA copy numbers/μg brain DNA of three independent experiments (±SEM) was calculated. Then, comparisons between all groups of mice, analyzed for the presence of Cpn DNA in brain tissue, were performed with three-way ANOVA with Treatment (Cpn infection or mock infection), Time-point of analysis (1 week, 1 month or 3 months p.i.) and Brain region (olfactory bulbs, cerebellum, hippocampus, subventricular zone or neocortex) as fixed factors. P values smaller than 0.05 were considered statistically significant. Calculations were performed with SPSS v. 12.0.1 for Windows (SPSS, Chicago, IL, USA). As also shown in Table 1, n = 29 mice were used to detect Aβ aggregates in brain tissue with immunohistochemistry at different time points after infection with Cpn, mock infection or without any treatment, respectively. To this end, the animals received a weight-adjusted dose of pentobarbital (Nembutal; Sanofi Sante B.V., Maassluis, The Netherlands) and were then subjected to intracardial perfusion fixation, as previously described . In case of the APP751SL/PS1M146L mouse, anaesthesia was performed with chloral hydrate (10% aqueous solution, 0.005 ml/g body weight, i.p.). Brains were removed rapidly and post-fixed for 2 h at 4°C in the same fixative, omitting the glutaraldehyde. In case of the APP751SL/PS1M146L mouse, the brains were halved in the midsagittal line. Brain tissues were then cryoprotected by immersion in 30% sucrose in Tris-buffered saline at 4°C overnight. Afterwards, brains (or brain halves, respectively) were quickly frozen and stored at −80°C until further processing. For immunohistochemical analysis, the entire brains (or the right brain half in case of the APP751SL/PS1M146L mouse) were cut into entire series of 30-μm-thick frontal sections on a cryostat (Leica CM 3050 S; Leica, Nussloch, Germany). After cutting, sections were again stored at −80°C until further processing. 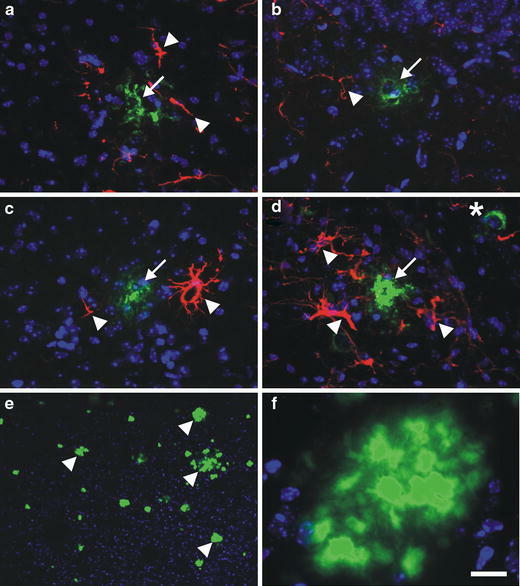 Immunohistochemical detection of Aβ (as well as of glial fibrillary acidic protein) was performed with standard immunofluorescence procedures using a first layer, consisting of a combination of mouse anti-human amyloid 17–24 (4G8 clone; 1:1,200 in TBS-T; Sigma-Aldrich, St Louis, USA) [3, 16, 33] and polyclonal rabbit anti-mouse GFAP (1:1,600 in TBS-T; DAKO, Glostrup, Denmark). The corresponding secondary antibodies were donkey anti-mouse Alexa 488 (1:100 in TBS-T; Molecular Probes) and donkey anti-rabbit Alexa 594 (1:100 in TBS-T; Molecular Probes). Finally, counterstaining was performed with Hoechst (1:500 in TBS; Sigma, St Louis, MO, USA) and sections were mounted on gelatine-coated glasses. As a negative control, sections were only incubated with the secondary antibodies. For the detection of extracellular, fibrillary Aβ, a standard thioflavin-S (Sigma) staining was performed. Finally, the sections were counterstained with Hoechst and mounted as described above. Microscopic inspection of sections was performed with a MBF Bioscience Stereo Investigator Confocal Spinning Disk (SI-SD) system (MBF Bioscience; Williston, VT, USA), consisting of a modified Olympus BX51 fluorescence microscope (Olympus, Tokyo, Japan) with UPlanSApo objectives 10 × (N.A. = 0.4), 40 × (N.A = 0.9) and 100 × (oil; N.A = 1.4); Olympus, customized spinning disk unit (DSU; Olympus), computer-controlled excitation and emission filter wheels (Olympus), three-axis high-accuracy computer-controlled stepping motor specimen stage (4 × 4 Grid Encoded Stage; Ludl Electronic Products, Hawthorne, NY, USA), linear z-axis position encoder (Ludl), ultra-high sensitivity monochrome electron multiplier CCD camera (1,000 × 1,000 pixels, C9100-02; Hamamatsu Photonics, Hamamatsu City, Japan) and controlling software (MBF Bioscience). In case of sections processed for the detection of Aß and GFAP, digital RGB image stacks showing the same microscopic field in 50 consecutive focal planes with a distance of 0.5 μm between the focal planes were generated with the 40× objective. In the case of sections stained with thioflavin-S, digital image stacks showing the same microscopic field at 150 consecutive RGB focal planes with a distance of 0.2 μm between the focal planes were generated with the 100× objective. From these image stacks three-dimensional reconstructions (maximum intensity projections) were produced with Imaris software (Version 4.0; Bitplane, Zurich, Switzerland). In addition, low-power photomicrographs (10×) were taken from sections stained with thioflavin-S. Final figures were constructed using Corel Photo-Paint v.11 and Corel Draw v.11 (Corel, Ottawa, Canada). Only minor adjustments of contrast and brightness were made, without altering the appearance of the original materials. No deconvolution was performed on images obtained by confocal microscopy. At 1 week p.i., the mean Cpn DNA copy number per μg DNA was 310.97 ± 61.6 (mean ± SEM) in the olfactory bulbs, 2.6 ± 0.8 in the cerebellum and 7.9 ± 0.8 in the hippocampus, while no Cpn DNA was detected in the subventricular zone and the neocortex (Table 2). No Cpn DNA was detected in any brain region of the Cpn infected mice at 1 and 3 months p.i.. Furthermore, Cpn DNA was not detected in the brain of mock-infected BALB/c mice at any time point. Statistical analysis revealed significant differences among the groups of mice with respect to Treatment (T) (P = 0.024), Time point of analysis (Tpoa) (P = 0.008) and Brain region (Br) (P = 0.002), as well as with respect to the combinations T–Tpoa (P = 0.008), T–Br (P = 0.002), Tpoa–Br (P < 0.001) and T–Tpoa–Br (P < 0.001). Amyloid beta immunoreactivity was found in the brains of all mice, i.e. in Cpn-infected BALB/c mice at both 1 and 3 months p.i. (Fig. 1a), mock-infected BALB/c mice at both 1 and 3 months after mock infection (Fig. 1b), not inoculated BALB/c mice (Fig. 1c) and in APP751SL/PS1M146L mice (Fig. 1d). However, Aβ-immunopositive aggregates were found only occasionally in the brains of the BALB/c mice (on average one to two aggregates per section without a preference for a certain brain region), whereas they were found abundantly in hippocampus and neocortex of APP751SL/PS1M146L mice (see also Fig. 2H in ). Furthermore, there were several qualitative differences between the APP751SL/PS1M146L and the BALB/c mice. First, in the brain of APP751SL/PS1M146L mice, the materials immunopositive for Aβ formed a dense core, devoid of Hoechst-positive structures (i.e. cell nuclei). In contrast, the materials immunopositive for Aβ in the brain of BALB/c mice did not present with a dense core, and Hoechst-positive structures were scattered within these materials. Second, the astrocytic reaction in the brain of APP751SL/PS1M146L mice, surrounding the Aβ-immunopositive materials, was much stronger than in the brain of BALB/c mice (arrowheads in Fig. 1a–d). Third, in the brain of APP751SL/PS1M146L mice, cells with intracellular deposits of Aβ were found (asterisk in Fig. 1d), which was not observed in the brain of BALB/c mice, irrespective of treatment. In the brain of APP751SL/PS1M146L mice, extracellular thioflavin-S-positive structures were found (Fig. 1e, f) as also previously reported [4, 26], resembling fibrillary Aβ deposits. Such extracellular thioflavin-S-positive structures were not found in the brain of BALB/c mice. The role of inflammatory factors, predominantly caused by infections, in the initiation or acceleration of neurodegenerative diseases is increasingly recognized. Next to several viruses [6, 12, 13, 17], the obligatory intracellular bacterium Cpn has also been linked to a variety of neurodegenerative diseases such as AD. In 1998, the presence of this pathogen was described in postmortem brains from patients with AD . That Cpn may contribute to neurodegenerative processes was recently supported by data from our laboratory, as we demonstrated that Cpn is able to infect neurons, ultimately resulting in neuronal cell death in vitro . However, to the best of our knowledge only one experimental in vivo study has been published so far supporting a role for Cpn in AD . In this study, naïve BALB/c mice were inoculated intranasally with Cpn at an age of 3 months. Brains were recovered at 1–3 months p.i., revealing the presence of amyloid-like plaques and astrocyte reactivity. Due to the possible impact of this study, it was our goal to confirm these data by repeating these experiments. Focusing on our results of Cpn-inoculated mice at 3 months p.i., material immunopositive for Aβ was indeed detected in the brain. Accordingly, at first glance, our results are in line with the study of Little et al. . Comparing the morphological appearance of this material immunopositive for Aβ with corresponding material in the brain of APP751SL/PS1M146L mice, however, some significant and important differences were observed. First, one characteristic of neuritic (AD) plaques is the presence of filamentous, star-shaped aggregates of Aβ fibrils with a thioflavin-S-positive dense core. However, neither such star-shaped aggregates of Aβ fibrils nor extracellular thioflavin-S-positive structures were found in any of the brains of Cpn infected or mock infected BALB/c mice, whereas both lesions were abundant in the brain of APP751SL/PS1M146L mice. Second, no damage was found in the tissue surrounding the material immunopositive for Aβ. Rather Hoechst-positive structures (i.e. cell nuclei) could be detected within the material immunopositive for Aβ, a feature that was not seen in the brain of APP751SL/PS1M146L mice. Finally, although astrocytes were found in the vicinity of the material immunopositive for Aβ in the brain of Cpn infected or mock infected BALB/c mice, they were not intimately associated with the Aβ immunoreactivity, as seen in the brain of APP751SL/PS1M146L mice. 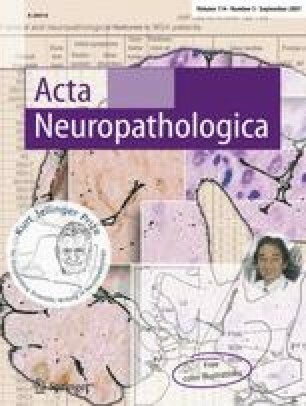 In summary, except that Aβ plaques were detected in most brains, our data suggest that at 3 months after Cpn infection most characteristic features of AD pathology could not be detected in 6-month-old naïve, non-transgenic BALB/c mice, whereas these were prominent in the brain of the “control” APP751SL/PS1M146L mice. It may still be argued that the material immunopositive for Aβ in the brain of the Cpn-infected mice represented early precursors of neuritic plaques. To our surprise, however, nearly identical patterns of Aβ immunoreactivity were detected in mock-infected BALB/c mice as well as in BALB/c mice, neither Cpn infected nor mock infected. This suggests that the observed immunoreactivity for Aβ in the brain of BALB/c mice does not directly result from Cpn infection but might represent unrelated elevations in amyloid. Positive staining for Aβ in the brain of mock-infected mice was also observed by Little et al. , who found that the amyloid deposition load and size were significantly enhanced in Cpn-infected mice compared to mock infected ones. As outlined above, this was not found in the present study. Furthermore, Little et al. also demonstrated the presence of a small subset of thioflavin-S positive plaques, which were not found in our mice. These discrepancies between the study by Little et al. and the present study could be due to the fact that Little et al. used a Cpn strain (C. pneumoniae, 96-41, isolated from the postmortem brain of an AD patient) that was rather different from the Cpn strain used in the present study (TWAR 2043, ATCC). Notably, Little et al. , were able to detect Cpn in olfactory tissues of infected mice up to 3 months p.i., by both light and electron microscopy. In the present study, however, we were only able to detect Cpn DNA in the olfactory bulb of infected BALB/c mice at 1 week p.i. but not at 1 or 3 months p.i., despite the use of a more sensitive detection method (real-time PCR). As it is well established that the clinical isolates of pathogens are often more infectious than their laboratory counterparts, this could partially explain the discrepancy between both studies. Furthermore, it cannot be excluded that differences in solutions used for mock infection (Hanks balanced salt solution in the study by Little et al. vs. SPG solution in the present study) may have affected the final outcome. Yet, in the present study, the immunosignal in mice that were neither Cpn infected nor mock infected appeared somewhat weaker than in the brain of the BALB/c mice that were either Cpn- or mock-infected (a detailed quantitative analysis was not performed). This suggests that intranasal application of Cpn or other infectious agents may trigger the production and deposition of Aβ in the brain of BALB/c mice. For the time being, however, the impact of this remains unclear. In conclusion, our data do not unequivocally support the hypothesis that Cpn infection induces the formation of AD like Aβ plaques in the brain of BALB/c mice, as suggested by Little et al. . Accordingly, future studies are required to investigate whether Cpn infections may aggravate AD pathology by stimulating the formation of Aβ plaques as has been suggested in atherosclerosis, a disease that is also characterized by pronounced local inflammation. We thank Sofie Lemmens for excellent technical assistance. This study was supported by grants from the International Alzheimer’s Research Foundation (ISAO; The Netherlands) and the Netherlands Organization for Scientific Research (NWO; The Netherlands).